We love helping children learn to eat. Not just because it helps the child, but because it completely transforms entire families. We’ve seen it over and over again. We thoroughly enjoy hearing about our families’ experiences. Ayram was tube fed since 3 months (NG tube) when we first came to Austria. It might seem a short time, but when you struggle with late bottle-feedings and wakes in the middle of the night to prepare the first feed, it’s already quite a journey! We were exhausted, always on the alert because Ayram was a world champ to remove his tube… Adjusting the fastening points was always a moment of cries and tears, and positioning the tube was even worse. This feeding tube, a necessary evil to cover the nutritional needs of our little boy, was hefty to manage. We were actually in the process of medical tests to equip Ayram with a gastrostomy tube before winter. When we arrived in Austria, I was certain that my little boy liked only tasteless food and could not manage small pieces of food, even the tiniest. My first surprise was to see him eat a bacon potato chip and actually enjoy it! Because Ayram was still a little baby (6 months old) he hadn’t truly experienced food yet. While he does not like milk and refuses his bottle-feeds, he had no fear to bring to his mouth whatever came to hand. Nutella, mayonnaise, salami… he discovered with wonder all these previously unknown tastes. Of course, we had to wash him and change his clothes 3 times a day, but what a joy to see his abilities to feed himself by mouth! NoTube is an interdisciplinary team. Doctors, coaches, psychologists – the whole biopsychosocial state of the child is treated. Their approach is systemic and that’s why it works. Their extensive experience is a crucial support in this period of transition, for which it’s fundamental to be well supported. 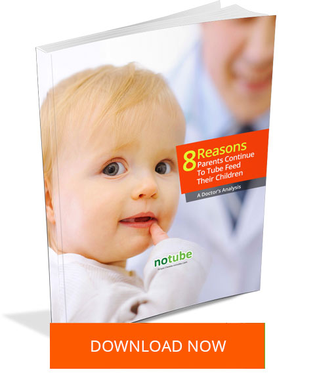 Allowing your child to gain autonomy, supporting him in his learning of food and not having to rely on the tube to dictate when and how much he should eat, requires working on oneself, with the support of experienced professionals as the NoTube team. Each day without having to adjust the fastening points, each night without wondering if he will take off his tube, each smile on his face without these horrible tubes, are a wonderful gift that we truly enjoy. Without this providential meeting with a (non-medical) person who took the time to present us NoTube, we could easily have missed this wonderful Eating School… My little boy would have a tube in his tummy, a smaller stomach (Nissen fundoplication) and would have gone through a lot of sufferings. Fortunately, NoTube has prevented this to happen. This very thought is enough to give me a smile in rainy days. Discover the common misconceptions that exist that prompt parents to continue tube feeding although it’s no longer medically necessary. The common misconceptions about the necessity of ongoing tube feeding. Why some parents are afraid to free their children from the feeding tube. The options available for parents who wish they could teach their child to eat.